"Nothing makes me more sad than seeing an empty building." I couldn't believe that Brian (the son of an achieved business man, who's achieving himself these days), would think the empty Kmart was "sad." I couldn't believe this, especially compared to all the other sad things in the world (injustice, abuse, broken families, violence). Yet at times, I realize that I like Brian see empty buildings as something that is sad. The other day when I heard that Frontier Airlines, the Denver-based airlines had filed bankruptcy last Thursday I found myself, like Brian, "sad." The free market capitalist side of me says: "this is okay, when businesses fail it is because there's either not enough demand to meet the supply, or someone else is doing it better and cheaper." Yet that cold-realist economic outlook isn't probably that comforting to the thousands of people that work for the airline. Nor is it good in the short term for Colorado tourist, or Colorado business and personal travelers who will see rising prices on airline flights. I used to think Brian's response to the deserted buildings, and "store closing" signs as sad was overly-American-capitalistic. But I know embedded in Brian's logic of sadness he saw lost jobs, lost hopes, lost dreams. He saw wasted capital, wasted real estate, wasted buildings. Things readjust, but they adjust slowly, and it's the gaps in the middle of hope, use and prosperity that make things sad. The closed Kmart Brian saw in college eventually was torn down and made room for a major expansion and increased parking lot size for the neighboring Walmart. 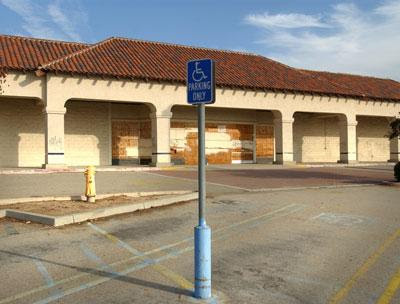 Well, as much as I dislike the big discount houses like WalMart or K-Mart, seeing one empty is sort of sad. It means that people lost their jobs.